Thank you for this excellent explanation Patti! Patti wrote: Regarding using the term influence for the lines that radiate out from inside the life line, I think Kiran has picked up the understanding of it that I wanted to convey. The implications of markings in the hands can not always be defined by a single word and a group of words can be helpful. People who have difficulty being strong and making decisions for themselves will also have too many lines. People who have been weakened by health problems will have too many lines here too. One or two lines only, (more frequent in men of few lines) will most likely relate to extremely important times, marriage, birth of a child, death of a loved one, loss of job etc. People overly sensitive to what others think will have too many lines here. Those are the pleasers. Leaning index finger toward the thumb will empasize this. All fingers leaning would exaggerate this. These are things that stress you out, cause you worry and influence the minor and major decisions of daily life. The length, depth and quality of the line shows how much the situation made an impact. The strength of the life line and inner Mars lines show the quality of resistance to the influences. People who lack these lines are not sensitive to outside interference or influence. They may lack awareness that they were supposed to notice something. These people are usually men and strong willed. zaobhand wrote: It helps a lot. Very informative and interesting. Still I think the name "stress or worry lines" fits better since it encompasses all the scenarios. But they have more of a negative connotation. I'm starting to get used to "Influence lines" but as I hear it I can't help starting to think what does this mean, rather have the content encapsulated by the name. The hands do not oblige this. It's also the cause for misconceptions and narrows a very broad concept that shouldn't be viewed in isolation into a simplified label. It did make us think and understand better these lines through your experiences. I'll digest this more and probably with time gain better feeling for the concept. Boaz, I think one of the reasons we can't narrow it down to one word or that the idea of worry alone isn't enough is because what we are looking at is the bodies' reaction to an experience. Hi Patti, why would a leaning index finger indicate this? When the index finger is leaning towards thumb, its separated from other finger? Then it is called - "Independence of actions" as the index finger is standing out independently! It has to do with body language. If the index is separate from the middle finger it does add independence or an openness to action. Index leaning toward the thumb is quite commonly seen on service people especially nurses and social workers. They tend to be helpful and easy to approach. Patti, pls, can you also explain the rational behind this? Kiran.Katawa wrote: Patti, pls, can you also explain the rational behind this? The rationale behind why people who are service oriented and helpful tend to hold their hands so that the index finger appears to lean toward the thumb? Another important feature to note is how straight or crunched up the area is between the base of the thumb and base of the index finger. There are all kinds of combinations here and all of them have to do with a form of self-esteem and confidence and how that is shown. Hi Patti, yes - you got my qtn right. But, didn't answer it. You told about the characterstics of the other way round features. My understanding is like this(Exactly opposite to yours): When Index leans towards Thumb, it indicates that the thumb influences the Index finger. So, the person tends to manifest, implement what he/she desires/aims. And if all the fingers are leaning, this would exaggerated and so the person can be selfish, self-attending. Just wondering if I am mistaking on what you're saying as "Index leaning towards thumb"! 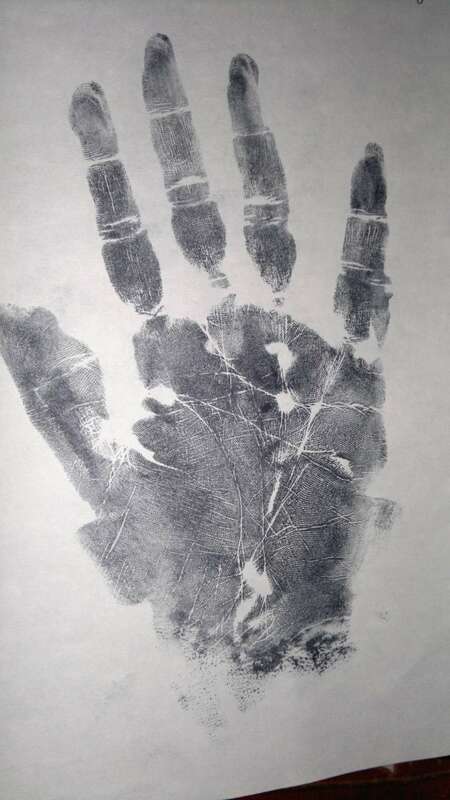 Do you have a sample handprint/picture for the same? Kiran.Katawa wrote: Hi Patti, yes - you got my qtn right. But, didn't answer it. You told about the characterstics of the other way round features. Interesting. Do people you say this to, agree they are 'selfish and self-attending'? This is one of those things you'll learn better by reading hands and asking for feedback. Especially since you have a different interpretation. I'll watch for someone to upload their hands with this feature and call it to your attention when I notice. I don't think I'm alone in my interpretation. I recall Lynn, Sue and I and perhaps others having this discussion once a number of years ago and as best I remember we were in agreement. I would say the 'selfish and self-attending' people would have fingers that leaned away from the thumb. Fincham considers fingers leaning toward thumb as lacking in the self. Seeking external to give sense of self. Superficial personality. Fingers leaning toward pinky as a extreme introverts. So his interpretation needs to be reexamined? Off topic, quick question. Just seen left hand with rather wide separation between head and life line. Right hand she says the lines used to be separated but now the are connected by several lines which plunge slightly into Mars area. I asked whether she has become combative with the years, which she confirmed. I also know her bit. Have you seen this? zaobhand wrote: Fincham considers fingers leaning toward thumb as lacking in the self. Seeking external to give sense of self. Superficial personality. Fingers leaning toward pinky as a extreme introverts. So his interpretation needs to be reexamined? I would agree with Fincham's interpretation regarding lacking in self, but that would involve the area between thumb and index to be weak as well. I have't noticed the extreme introverts holding their fingers toward the pinky. You often see this stance on celebrities and politicians who are 'full of themselves', so to speak. 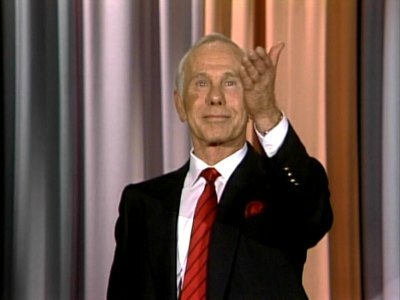 When I was teaching palmistry classes, Johnny Carson was still on late night television and I would tell my students to watch how he would position his hands. He would often lean his fingers toward the little finger. He wasn't known for being warm and friendly to everyone and was said to be introverted socially, yet he was a well known celebrity. Here you can see it in his left hand. I tend to look at the life line for introversion and extroversion. I would read confidence and esteem in finger stance. Same as posture in the rest of our body. 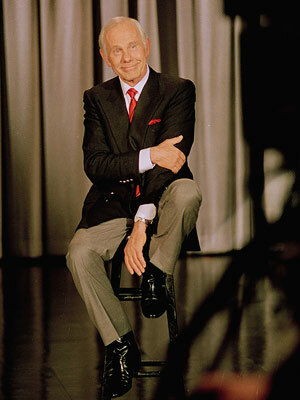 Do we slouch or stand up straight, look down when we walk or straight ahead. I googled "arrogant actors" in images and this photo showed up? Anyone know this guy? He's holding his hand with the fingers strongly leaning toward the little finger. I think I see what it means by fingers strongly leaning toward small finger. Cool. I have a picture here and I know this person. I found her to be self-centered and bit arrogant. It is matching to what Johnny is saying as "The person has serious lack from inside. They are literally toppling over thru dependence on partner, life role, career, family" exactly matches to her. I amn't sure whether she is selfish. I havn't asked her about being selfish/self-attending.But, since, I knew her and was in same friend's group and she was quite expressive( you can see her heart line) and talkative - things were pretty clear about her. I differentiate selfish from self-centered. Selfish is just attending to the needs of self. However, self-centered is: being aroud SELF always. Like - describing about what one possess materially, how is s/he performing etc. But, being self-centered needn't stop the person from helping others, while selfish might stop. I acknowledge that, I don't have much practical experience here and havn't seen many such cases. So, I amn't disagreeing with what you( or Lynn and Sue) are saying. Somehow, the logic for this conclusion(Index leaning toward the thumb is quite commonly seen on service people especially nurses and social workers. They tend to be helpful and easy to approach.) isn't convincing. See this case of toppling apollo finger by Jena: http://handanalysisonline.com/are-you-trying-to-hide-something-hand-analysis-tip/toppling-apollo/ . What Johnny is saying matches to what Jena is writing. I am applying the same logic to Index finger also. "The person has serious lack from inside. They are literally toppling over thru dependence on partner, life role, career, family" exactly matches to her." This I would apply to how the hand crumples up between the thumb and index finger. No backbone - little self esteem - in the moment. Hand position/posture is not permanent. Maybe chronic or habitual, but not permanent. The only thing I don't see in her hand that you mention is arrogance. The thumb does look large. With her heart and head lines both so high in her long hand, I'd think this would cause her to be more emotionally aware of needs and thoughts. Everything feels close to the surface. The way she holds her thumb here shows some kind of fear, too. Overly cautious to act independently. Would she come across as 'self important' rather than arrogant? Her life and head lines start high. If she held her hand straight, it appears that these two lines are closer to the index finger than to the thumb. Genetically this could imply that she comes from people who are high achievers or have high expectations in life. I wonder if the weakness of some of the other features are being compensated by these high set lines and the strong thumb. Hi Patti, "Self Important" was clearly visible. Arrogance - as I said: "a bit". Since, she was quite expressive and addressing her needs first, straight on face, may be I felt so. I don't remember/noticed whether the hand was crumbling b/w index and thumb. But, in the picture, it doesn't look so. Isn't it? That portion is clear with the ink.